Interplay has signed a definitive agreement with Masthead Studios to continue development of its post-apocalyptic MMOG, codenamed Project: V13, planning to reach the public beta phase by 2012. 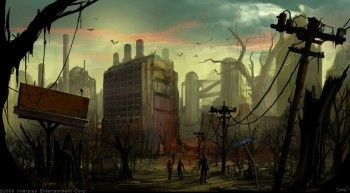 Despite the legal battle swirling between Interplay and Bethesda on the rights to the IP of the Fallout universe, Interplay is continuing the development of its post-apocalyptic MMOG. Depending on how the judge rules, the MMOG may bear the Fallout name when it is released. Project: V13 has been in development at Interplay since 2007 by some of the designers who worked on the original Fallout back in 1997. Masthead Studios joined the production team in 2009, and will bring its experience creating the sci-fi MMOG, Earthrise, to bear on Project: V13. "Masthead's technology is impressive and perfect for our Project: V13. Its team is passionate to bring our vision and game play to the market," said Herve Caen, CEO of Interplay. "This MMOG will have many unique features that we will disclose before launch of the public Beta in 2012." The legal struggles between Interplay and Bethesda have been well-reported and it's hard to divorce this announcement from those proceedings. It was recently revealed that Bethesda has been working on a huge MMOG, but it is based on the Elder Scrolls IP. Does this announcement mean to show the judge that Interplay is more committed to bringing a Fallout MMOG to the market than Bethesda is?